Berzerker_prime's Adventures at NoBrand Con 2003! NoBrand Con is a small convention in Eau Claire, Wisconsin put on by the UW Eau Claire's Anime club. It is not only an Anime convention, but a Scifi and gaming convention as well, although it was light on the scifi. It was here that the Gung Ho Otaku made their second appearance as characters from the fan-made video fight game, Glove-On Fight. The idea came to us over party drinks and a session of the game at the Anime Club's Halloween party and we ran with it. Our group didn't win anything this time around either, although it should be noted that other groups who probably should have won something also didn't. There was more than a little unrest among the cosplay contest participants on how the judging was conducted. My mad props go out to the three ladies who cosplayed as a very well done Mystic Knights Rayearth. You guys should have won something. 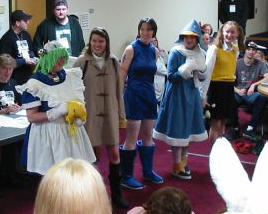 Other Gung Ho Otaku participants were Megan Fellows as Ciel, Margaret Fellows as Eccoko, Deanna Morrison as Ayu, and Carolyn Hays as Satsuki. Since it was also a SciFi convention, I whipped out my "Lindirawyn" Elf costume for another go on Friday night. As I checked in, I had the honor of being the convention's first costumer! Some of my other activities at the convention included participating in games such as Ninja Burger, BESM, and Vampire: The Masquerade, as well as participating in the fanfiction contest where I took second place (read the fic here). Also, I donned parts of my Elf costume to participate in the LARP fight tournament with fellow Gung Ho Otaku Megan Fellows. 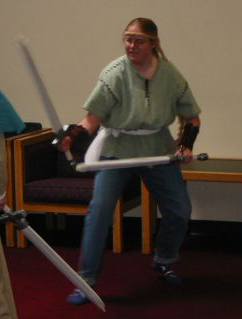 She took second and I took third and I also spent some money on the two foam short swords for the competition. Beware, everyone! I've been practicing! Fast Facts: This was the first time I had a shtick; I handed out jingle bells all day on Saturday. When I wore the Dijiko costume at Anime Central 2003, I actually had someone ask where I bought the Gema-Gema, the nicest compliment I have ever recieved (if you're reading this, whoever it was... THANK YOU!!!). At the LARP tourney, I was told both that I had a good guard and that I was scary. Despite the fact that it was April, it was freaking COLD and we got about 6 inches of snow. Gotta love Wisconsin.